Leading off today: Dylan Laube scored 40 touchdowns a season ago, and the Westhampton senior is off to flying start in 2017. He scored four TDs in Friday's season-opening, come-from-behind 42-38 victory over Bellport -- including a pair in the final 5:14. And then he made the key play of the night. After Laube's 1-yard TD run with 1:54 left, Bellport drove to the Westhampton 3-yard-line with :13 to play, but Laube blasted through the line to disrupt a handoff and took down running back D.J. Trent (21 carries, 153 yards, four TDs) for a loss to run out the clock. Westhampton, which lost fullback/linebacker Liam McIntyre to a broken hand on the first play, was down by as many as 17 points in the fourth quarter. "The only thing that matters is the win," Laube said after finishing with 29 carries for 262 yards. "We had to stop them or the comeback would mean nothing." Tyler Nolan started the comeback with a 62-yard TD run and Laube added 2- and 1-yard scoring carries. OT on the Island: G.Q. Grippo scored on the second play of overtime as Connetquot, playing without injured quarterback Dylan McDermott for most of the second half, edged Ward Melville 34-26. Cole Bunicci tied the game midway through the fourth quarter on a 27-yard interception return. In OT, Grippo scored from eight yards out and tacked on the conversion run. Connetquot's defense then wrapped up the victory by holding Ward Melville on 4th-and-8 from the 18. Big PSAL opener: Curtis' defense of the PSAL city championship got off to a sluggish start with a 39-20 loss to star-laden Erasmus Hall. Senior Shamar Logan (4 carries, 127 yards) ran for one TD and scored another on a reception to pace the Dutchmen. First-year QB Keion Jones threw two touchdown passes. Curtis had closed to within 27-20 late in the third quarter before Logan ran for a 44-yard touchdown. Curtis had defeated Erasmus Hall 24-21 in the 2016 championship game at Yankee Stadium. Mahopac pulls a surprise: Mahopac coach Dominick DeMatteo picked up a win against his former school as the Indians downed Arlington 19-14. Tim Cegielski finished with 139 yards and a TD on 29 carries. A season's worth of picks: We can only assume Section 1 quarterbacks are done throwing in the general direction of Ryan Elliott. Elliott intercepted three passes as defending NYSPHSAA Class A champion Somers opened with a win last week vs. Poughkeepsie, and he picked off three more in a 21-14 win over Rye. Somers forced six Rye turnovers, including five interceptions. Antonio Vieira's interception with 2:00 left set up Andrew Cassin's winning touchdown. Offensive fireworks: Mitchell Seabury ran for six TDs as Fayetteville-Manlius outlasted Syracuse Henninger 49-38 in a game featuring 67 second-half points. F-M led 14-6 at the half and 28-18 entering the fourth quarter. Seabury (32 carries, 341 yards) scored three TDs in the final 12 minutes, including a 42-yard romp to close out the scoring. More big numbers: Patrick Hackler threw for six TDs and 289 yards to lead Skaneateles over Port Byron/Union Springs 48-14. Sophomore receiver Nick Wamp finished with 218 yards and four touchdowns. 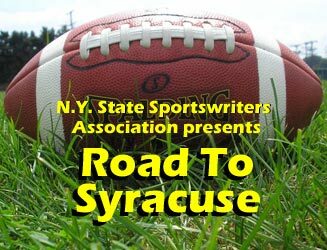 ... Joe Ward ran for five scores, threw for one and caught a TD pass as Troy routed Guilderland 59-26. Ward finished with 210 yards on the ground. ... Jacob Maurino scored five touchdowns as West Seneca East blanked Lake Shore 41-0. He ran for 175 yards and registered two sacks on defense. Scoreboard: Here are the results thus far from Week 2. More later: Many of us encourage young athletes to play multiple sports as a way of using different muscles and perhaps reduce the risk of injury. Well, it didn't work out too well for Friday for one athlete who plays two sports in the same season.